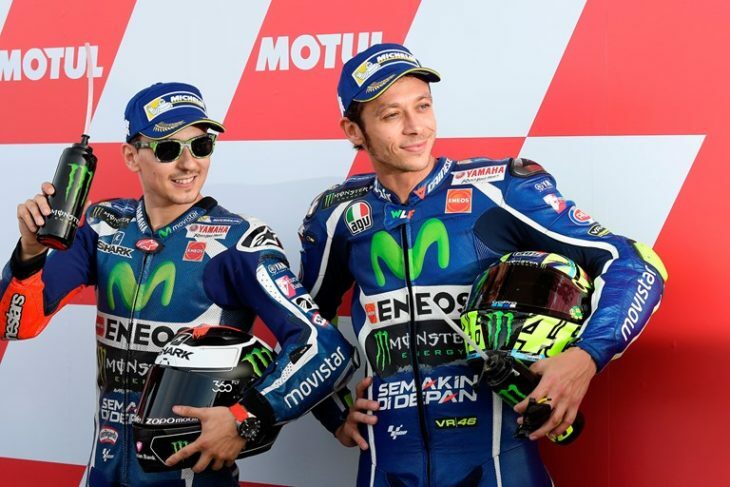 The Movistar Yamaha MotoGP team kept the momentum going during the Q2 session. Jorge Lorenzo was in a league of his own today, bettering the previous pole position record at Circuito de la Comunitat Valenciana Ricardo Tormo – set by himself last year – by 0.610s. Valentino Rossi was also in contention for a front row start and had the Spanish fans wait until the final minutes of the qualifying, to see him secure third place for tomorrow’s Gran Premio de la Comunitat Valenciana. Lorenzo was on good form in front of the Spanish crowd during the Free Practice sessions and gave another blistering performance later in the afternoon. He was one of the first riders to leave pit lane and didn’t waste any time to drop a time of 1’29.849s, a new pole position record, on his first attempt to put his name at the top of the provisional leader board. Having set the benchmark high he immediately returned to the pit box with ten minutes remaining. He quickly went out on track again and duplicated his stellar effort and set a 1’29.613s before making a second stop. He quickly dashed off again with over three minutes left to defend his number one spot. Flashing red through all the sectors, the Mallorcan signed off his impressive qualifying efforts with a 1’29.401s, leaving a 0.340s gap to his closest rival. Teammate Rossi also brought his a-game to this afternoon’s sunny qualifying session, to the delight of the local fans, with an impressive last-minute time attack. Avoiding traffic, he headed out as one of the last riders, giving him enough clear space on track. He gradually built up his pace, shooting up from eighth to fourth on his second lap, before setting a 1’30.539s for third place. With a provisional front row in his grasp he returned to the pits and there were four minutes remaining when he rejoined the session. Having been pushed back to seventh, the Doctor had to dig deep to reclaim third place on his next try. He further bettered his time to 1’30.128s, 0.727s from pole, on lap eight and secured third place to wrap up the last qualifying session of the year securing the seventh double front row of the 2016 season for the Movistar Yamaha MotoGP team. Monster Yamaha Tech3 Team rider Pol Espargaro will bolt forward from the rear of the second row tomorrow in what will be his last race aboard the Yamaha YZR-M1, after producing an impressive showing today in Valencia. The Spaniard kicked off his day by notably speeding to 6th in the morning practice where he finished only 0.487 from the top as he continued his momentum from yesterday. Later, in Q2, he got straight to work and after completing 8 laps, his personal best left him in 6th and just 0.264 from the front row. The qualifying marks a strong performance by the 2013 Moto2 World Champion and tomorrow he will set his sights on sealing the top independent rider honours in the season finale to close his account with the Tech3 team in a highly positive way. Meanwhile, Bradley Smith will contest his final Grand Prix for the Monster Yamaha Tech3 Team from the head of the fourth row of the grid after a hard fought display today at the Circuit Ricardo Tormo. His solid work yesterday paid off as he completed the ultra-competitive FP3 session in 10th and just 0.257 from his teammate after he posted his time on the 19th lap out of 21. This allowed him to pass straight through to Q2 and here he set off at speed in pursuit of clinching a strong grid placement for the Valencia GP. Smith’s efforts saw him qualify in 10th as he finished just over half a second back from the second row and tomorrow afternoon, he intends to close what has been a challenging year on a high note.